Himalayan Balsam (Impatiens glandulifera) was first introduced in 1839 to Kew Gardens (in the UK) from the Asian Himalayas as a greenhouse plant. It is an attractive annual plant with pretty bright pink flowers and belongs to the same family as the popular garden annual “Busy Lizzie”. However unlike the Busy Lizzie it can grow 2 or 3 metres high. By 1855 Himalayan balsam had escaped into the wild and it is now widespread in England and many other non-native countries where it has become invasive. 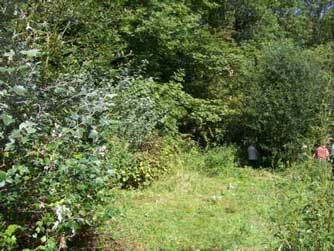 It loves damp conditions and colonises river banks and other damp areas such as marshland and woodland. In the country park it can be found around the edges of the seasonal pond. It grows in dense tall clumps and prevents light from getting through to the shorter native plants trying to grow underneath it. It can take over large areas if it is left unchecked. Mass of pink flowers around the pond as we began. As well as depriving native plants of light it also produces more nectar than any European species of plant and therefore lures the pollinating insects, such as bees, away from the native flowering plants. 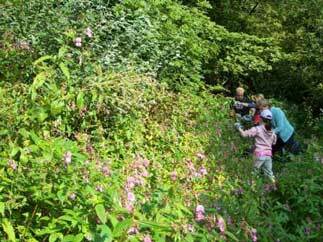 Scientists have measured this by placing pots of Himalayan balsam in special experimental areas where native plants were growing and then counting the number of bee visits made to the native plants. Fewer visits by pollinating insects means less pollination and less seed production, which is exactly what was found to be occurring in the native species. 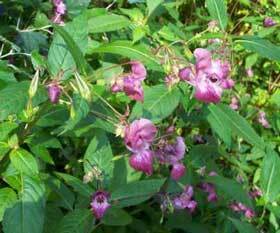 Large colonies of Himalayan balsam, in river bank areas, increase the chances of erosion. As an annual plant it dies back in winter exposing bare soil and with no roots of native grasses to bind it together, the soil can then easily get washed away. A single plant can set around 800 seeds. The seed pod bursts open at the slightest touch and seeds can be propelled up to 7 metres away. The 2-3mm black, rounded seeds float on water and in river bank habitats are carried downstream thereby establishing colonies in new areas. Not a pink flower in sight as we finished. The main aim in trying to control this plant is to prevent it from producing seeds. This year in the country park this was done by pulling up the plants before they flowered in June and then following up again in September before the majority of them produced their explosive seed pods. Next year it may be better to bring the second phase forward a month or so, as we all witnessed first hand the seed pods exploding! The plant has very small shallow roots and is easily pulled up by hand. Its seeds cannot remain dormant for very long so if a site is intensively managed it should be possible to dramatically reduce the population within 2 or 3 years. Let’s see what happens next summer!